Rosa Elfant Rickett is a highly knowledgeable New Jersey divorce and family law attorney who has extensive experience with matrimonial and education mediation. She serves as a trusted partner and advocate for clients undergoing private divorce mediation, court-ordered divorce mediation, and mediation for special education matters across New Jersey. During mediation, Rosa provides unwavering legal support and ensures that your interests are protected. 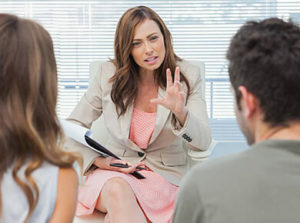 If you are considering mediation as a way to resolve your divorce, you are required to attend matrimonial mediation in New Jersey, you are using mediation to resolve a post-divorce matter, or you have a child with special needs and are seeking assistance for mediation with a local school board or school district, contact The Elfant Rickett Law Firm in Hackensack at 201.968.5700 to schedule a consultation. If you are getting divorced in New Jersey, chances are you will be involved in some form of mediation before your divorce is finalized. For some, divorce is a highly contentious process where everything becomes a battle. Whether there are conflicts over child custody, property division, alimony, or all of the above, the process of divorce can become long, arduous, and extremely expensive. With this in mind, some divorcing spouses agree to resolve divorce matters in a cooperative way, thus avoiding the emotionally and financing draining aspects of divorce litigation. When this is the case, mediation represents a viable option and often, an attractive form of Alternative Dispute Resolution (ADR). While some elect to mediate their divorces, New Jersey also requires divorcing spouses to attempt to resolve their divorce matters through the process of mediation before proceeding to traditional litigation. There are several mandatory mediation stages in New Jersey divorce, including the Parent Education Program (PEP), child custody mediation, and the Matrimonial Early Settlement Panel. The Parent Education Program and child custody mediation are geared toward resolution of child custody issues with the goal of creating a positive parenting plan. On the other hand, the Matrimonial Early Settlement Panel deals with issues involving property distribution and division of assets during divorce matters. If you choose to proceed down the path of divorce mediation, or you are required to attend mediation proceedings during the traditional divorce process, it is highly advisable to retain independent counsel. Having your own attorney who is committed solely to your best interests can provide you with invaluable insight and guidance, ensuring that you are fully represented during mediation proceedings. If you have a child with special needs, you may find yourself dealing with a conflict with a local school district regarding the specialized services to which your child is entitled under the law. Special education matters often proceed to mediation or conferences to arrive at solutions for children with disabilities. In fact, the Individuals with Disabilities Education Act (IDEA) provides parents with multiple avenues through which to resolve education disputes with schools. If your child has a disability and you believe that he or she is being denied a free and appropriate education, you can pursue a formal complaint and traditional litigation, but you may first attend a mediation or resolution session with the relevant parties. During education mediation sessions, the emotional nature of the issues at hand and the complexities of the legal aspects of special education matters can make it very difficult for parents. Having a seasoned New Jersey special education lawyer in your corner can ensure that all of your child’s rights are aggressively advocated for. If you are considering or preparing for a divorce or special education mediation, learning more about the process and your options from a highly qualified mediation attorney can be extremely helpful. If you have questions about divorce mediation or education mediation in New Jersey, or want to know how an experienced New Jersey mediation lawyer can help you, contact our offices in Hackensack today at 201.968.5700. We assist clients in Bergen County, Morris County, Essex County, Passaic County, and throughout New Jersey.